Washington, DC — January 31, 2019 — The Asbestos Disease Awareness Organization (ADAO), an independent nonprofit dedicated to the prevention of asbestos exposure through education, advocacy, and community work, applauds the announcement today of the Attorneys General of 14 states and the District of Columbia that are petitioning the Environmental Protection Agency (EPA) to require the asbestos industry to file reports on their imports of asbestos and asbestos-containing products and inform the Agency of how and where they are used. Today’s petition was co-led by Massachusetts AG Maura Healey and California AG Xavier Becerra and joined by the attorneys general of Connecticut, Hawaii, Maryland, Maine, Minnesota, New Jersey, New York, Oregon, Pennsylvania, Rhode Island, Vermont, Washington, as well as the District of Columbia. 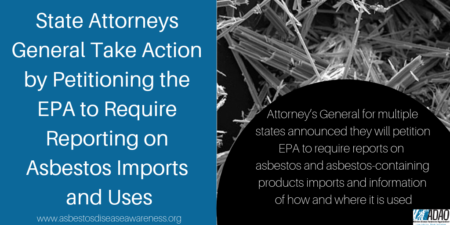 The state AG petition echoes the September 26, 2018 petition to EPA by ADAO and five other groups seeking similar reporting requirements for asbestos and disclosure of critical information about asbestos use and exposure to the public under the Toxic Substances Control Act (TSCA). EPA denied that “Right to Know” petition on December 21, 2018, and continued its pattern of failing to protect Americans from this deadly substance. The original petition from ADAO and other groups demonstrated that, because of a loophole in EPA regulations, the largest asbestos importer, Occidental Chemical Corporation, had failed to notify EPA of the amounts of asbestos it was bringing into the U.S.
Asbestos is among the most dangerous chemicals ever produced. Expert bodies agree there is no safe level of exposure. Recent research indicates that nearly 40,000 asbestos-related deaths occur in the US each year. Yet asbestos importation and use remains legal in the US, with limited exceptions. ADAO research proves asbestos imports surged in 2018. Concurrent with the state filing, ADAO sent a letter to Acting Administrator Wheeler to reverse his denial of the ADAO petition and submitted an extensive rebuttal of EPA’s grounds for rejecting the petition. In addition to ADAO, the September 26, 2018 petition was filed by the American Public Health Association (APHA), Center for Environmental Health (CEH), Environmental Working Group (EWG), Environmental Health Strategies Center (EHSC) and Safer Chemicals, Healthy Families (SCHF).